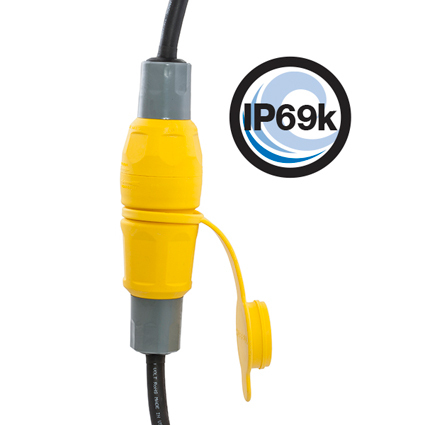 Hubbell Wiring Device-Kellems is excited to announce that its line of Watertight Wiring Devices is the first in the industry to carry an IP69k rating – the most aggressive and highest rank on the ingress protection rating scale, which classifies the degree of protection against dust and water in electrical enclosures. In harsh environments that must deal with potential exposure to water and dust, such as factories, food and beverage processing, agriculture, construction, and outdoor environments, protection against possible downtime due to exposure is crucial. In addition to carrying an IP69k rating, the Watertight Wiring Devices line also holds NSF (a 3rd party certification that affirms suitability in food processing environments), UL Type 3R, 4, 4X, 6, and 6P environmental ratings. For more information about Hubbell Wiring-Device Kellems’ Watertight Wiring Devices line, contact your Hubbell sales representative or visit www.hubbell.com/wiringdevice-kellems/en. Hubbell Wiring Device-Kellems is excited to announce its latest eTour: an interactive, 360-degree Installation Efficiency eTour, which identifies Hubbell solutions that can efficiently deliver power, data, and AV—while also supporting fast installation. This immersive tour provides a detailed look at malls, hospitals, hotels, universities, construction projects, and more.